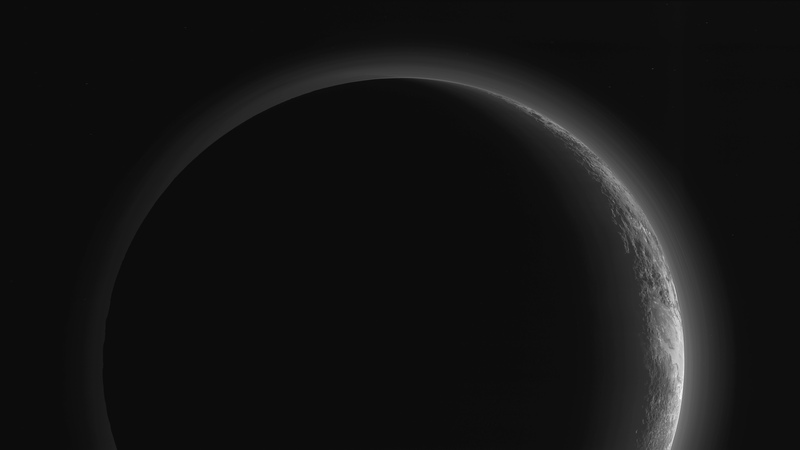 October 29, 2015 – The New Horizons team has released a new, breathtaking image of Pluto’s crescent. The image was made 15 minutes after New Horizons’ closest approach to Pluto on July 14, 2015, as the spacecraft looked back at Pluto toward the sun. The wide-angle perspective of this view shows the deep haze layers of Pluto’s atmosphere extending all the way around Pluto, revealing the silhouetted profiles of rugged plateaus on the night (left) side. The shadow of Pluto cast on its atmospheric hazes can also be seen at the uppermost part of the disk. On the sunlit side of Pluto (right), the smooth expanse of the informally named icy plain Sputnik Planum is flanked to the west (above, in this orientation) by rugged mountains up to 11,000 feet (3,500 meters) high, including the informally named Norgay Montes in the foreground and Hillary Montes on the skyline. Below (east) of Sputnik, rougher terrain is cut by apparent glaciers. The backlighting highlights more than a dozen high-altitude layers of haze in Pluto’s tenuous atmosphere. The horizontal streaks in the sky beyond Pluto are stars, smeared out by the motion of the camera as it tracked Pluto. The image was taken with New Horizons’ Multi-spectral Visible Imaging Camera (MVIC) from a distance of 11,000 miles (18,000 kilometers) to Pluto. The resolution is 700 meters (0.4 miles). Alan Stern of the Southwest Research Institute in Boulder, Colorado is the principal investigator for the New Horizons mission. Ball Aerospace and LASP also contributed to the mission.